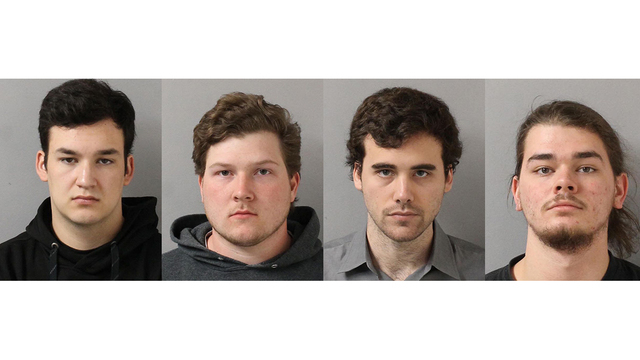 NASHVILLE, Tenn. (WKRN) - Four men have been charged with the 2018 death of a 17-year-old. 20-year-old Gunnar Scragg, 20-year-old Ethan Oakley, 22-year-old William Hemphill, and 21-year-old Nicholas Allen Parker were all charged with felony murder and aggravated robbery. Police said they had been investigating the death of 17-year-old Miles Hunter since Sept. 11, 2018. Hunter was killed that night when he fell from the running board of a 2017 Dodge pickup truck that contained the four men arrested. He died six days later. Detectives concluded that Scragg coordinated with Oakley, Hemphill, and Parker, to rob Hunter in the parking lot of the Hermitage Walmart on Andrew Jackson Parkway. During the robbery, police said Oakley sped off, causing Hunter to hang on as he stood on the running board. Police said that Scragg allegedly continuously punched Hunter to get him off the truck, causing him to fall and be ran over by the truck. The four men fled the parking lot. Scragg surrendered to police Monday evening. His bond was set at $100,000. Oakley surrendered to police Monday. He posted a $100,000 bond and released. Hemphill and Parker surrendered Saturday. They posted $30,000 and were released.